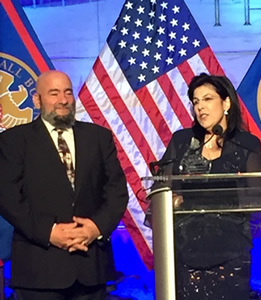 Congratulations to New York SBDC clients Stephen and Maryann Piazza, Owners of Majestic Vending and Services, on winning the 2016 Phoenix Award for Outstanding Small Business Disaster Recovery. Majestic Vending and Services, Inc. is co-owned by Maryann and Stephen Piazza. From its humble beginnings as a simple gumball machine at a construction site, the company has grown into a company that serves the NYC area with vending, office coffee, bottled water delivery and safety gear. One of its subsidiaries brings fresh, high quality ingredients together to use unique raw and organic sweeteners and/or herb savory flavors to glaze or roast nuts for onsite events or shipped direct to the home. The popcorn is always served hot and fresh on site. Majestic offers a portable bulk product kiosk that can accommodate patrons of all ages and palates, including gluten and sugar free treats. Since the company’s inception in 1994, the Piazzas have been long-term clients of the SBDC at the College of Staten Island. They received an SBA loan to purchase their warehouse. Maryann also received counseling from the SBDC to obtain her WMBE status with the State, City, and NY/NJ Port Authority. In addition, the SBDC encouraged her to successfully complete the Goldman Sachs 10,000 Small Business program. Maryann continues to grow and expand Majestic, especially as a New York State/New York City Certified Women’s Business Enterprise. Majestic was victim to wind damage suffered from Hurricane Sandy. A tree crashed into their chimney, which was attached to the parapet walls. As a result, the internal ceiling in the 1700 sq. ft. building collapsed in various areas covering the office, bathroom and warehouse. It destroyed everything it fell on… equipment, inventory etc. Because of the roof damage, five roof beams fell, damaging the electrical box and the gas pipe leading to the heating system. Their losses surpassed $72,000.00 in damages. The insurance company looked to settle for $1,572.00. They went to NYS Mediation, and finally after two years settled for $32,700.00. The insurance company then cancelled the policy. A grant was received from National Grid for $15,000, for capital improvements. In addition, Majestic applied for and received an SBA Disaster Loan in the amount of $32,000. The bulk of the money has already been used to replace the 1500 sq. ft. roof, the five roof beams, the roof drainage system, replacing 31 plywood decking boards, piping and repair, replacing the electrical circuits, 18 pieces of sheetrock ceiling, taping, spackling, priming, painting, replacing a smashed window that the tree fell through, two office doors and masonry repair work. They are currently proceeding on to the bathroom and the heating system. They are almost there. They have done all this to stay in business and continue their work in the community. Despite all of the hardships experienced by Majestic, the Piazzas have not only been able to continue their business, but have also been able to expand and diversify. A recent highlight of this is when Majestic was chosen by the NY/NJ Super Bowl Host Committee Business Connect as an Official Participant, to prepare and distribute several products and services the day of the first-ever two state (NY-NJ) hosting of the Super Bowl. Seeking to further develop her business acumen, Maryann applied and was accepted to the Goldman Sachs 10,000 small business program. She worked diligently and completed the program, significantly honing her skills and developing a much larger network of business contacts. Maryann is an active member of the Staten Island business and cultural communities. She is a member of the Staten Island Chamber of Commerce and the Staten Island Economic Development Corp. She is a business mentor with the Chamber’s YEA program, and an advocate for their Small Business Committee, which reviews pending legislation and its impact upon Small Business. She serves as a Consortium partner for the SIEDC. She has served in several leadership and officer positions with the Staten Island Bucks, a premier business networking organization. In addition to their activities in the business environment, they have reached out to the local community. They have translated their life lessons into the Majestic business model and have assimilated this in the neighborhood, hiring local residents and mentoring the next generations through the many programs on Staten Island. They currently participate and donate their time and resources to many business outreach and community events such as Lumen (SI ARTS), the Atlantic Salt Maritime Festivals, BOC Local Development Center, and Suit to Succeed, which offers grooming and interviewing skills to young adults ages 16- 24. Through the YEA program, they endeavor to fund, train, and bring new ideas and innovation to students so that they may realize how to become fiscally responsible for themselves as business owners. Despite many personal family and business challenges, including the devastation from Super Storm Sandy, Maryann and Stephen Piazza have been able to overcome and move on to new horizons. Participation in the Super Bowl as a vendor has brought Majestic to an entire new level of success. Majestic Vending, together with owners Maryann and Stephen Piazza, certainly exemplify the resilience and courage that the Phoenix Award represents. They not only have risen up from the ashes of Super Storm Sandy, but also are major contributors in their unselfish efforts on behalf of the community at large. For these reasons we are proud to recommend Majestic Vending and the Piazzas for the prestigious Phoenix Award for Small Business Disaster Recovery. Find your local SBDC now!